SIRIUS offers opportunities for bachelor students, masters students, PhD students, postdoctoral fellows and researchers. We offer challenging and interesting master’s projects, practical student assistant positions and the possibility for placements with our partner companies and other leading industrial organizations. SIRIUS wants to recruit talented candidates for their PhD programs, postdoctoral programs and researcher positions. These positions are aligned with both our research programs and our beacons. SIRIUS offers Master’s projects at many locations in our innovation pipeline. If you are theoretically inclined, we can offer projects that are linked to our research programs. Here you will be working on cutting-edge computer science problems. If you are interested in applications, we can offer projects linked to beacon projects and projects defined by our partners. We can also offer exchange projects with Petrobras and UFRGS in Brazil. SIRIUS is one of the groups that is hosting the Department of Informatics Researcher Track “Forskerlinje” from 2018. 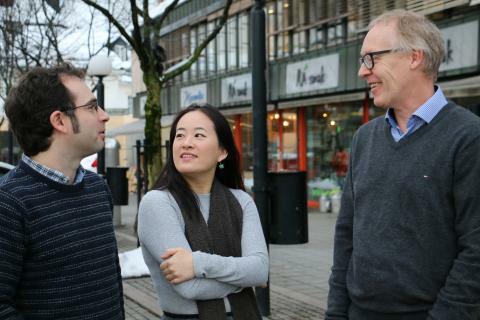 This program allows students in the bachelor programs at the University of Oslo to participate in meaningful research activities as part of their studies.